Sciatica is, generally, a type of lower back pain caused by a bulging or herniated disc. When the discs of your spine aren’t aligned properly, the supporting tissue between each bone can bulge out and press on the nearby nerves, causing sensations of tingling, numbness, and pain in the low back and often down the legs. 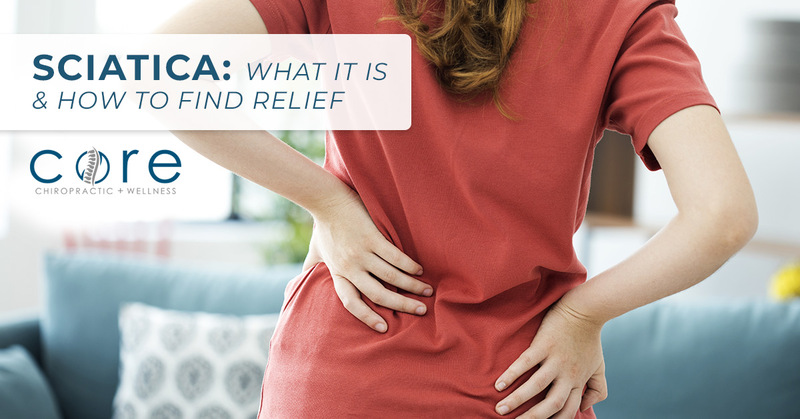 This type of lower back and leg pain refers specifically to when a bulging disc (or any other issue, like a bone spur) presses against the sciatic nerve. The sciatic nerve is a pair of two nerves that start near the base of the spine and run down each leg. Generally, sciatica pain is only felt on one side because of the split between the two separate nerve groups. However, because the sciatic nerve extends so far down the leg, you can feel pain, tingling, and numbness extend from your low back down your leg. The answer for relief lies in the cause. Since a bulging disc is often the cause of your back pain, the answer is to stop the disc from bulging. There are a few different reasons that can cause a disc to bulge. One is when the spine bones come out of alignment and press unevenly on a disc. Another reason is supportive tissue pulled too tight. Muscles, ligaments, and tendons pressing on the spine can push bones out of alignment. The answer for providing pain relief for sciatica is to help ease the spine back to proper alignment so the disc will be pressed on equally. While that explanation may make it sound onerous, rest easy. Relieving the back pain caused by sciatica doesn’t generally require invasive or painful procedures. Often, the best option for sciatica pain relief is to head to your local chiropractor for an adjustment. Well, more specifically, it will probably take a series of adjustments, stretching, and other chiropractic techniques because the goal is to relieve your pain, realign your joints, and help build up strength to prevent the issue from returning. Chiropractors are, by dint of their training and educational focus, the spine specialists. We use a combination of different techniques, like adjustments and manipulations, to make sure your joints are properly aligned and to ease the tension on joints that may come from tight muscles. Chiropractic care is designed to attend to spine and joint well-being, and we can help relieve pain and help with spine issues without the need for surgery. If you have concerns about sciatica or other back pain, get help from the specialists. Contact Core Chiropractic + Wellness to schedule a consultation in Bakersfield and see how we can help you.